American sounding rocket. Single stage vehicles consisting first of just the Nike booster were initially fired in the course of development of the Nike-Ajax surface-to-air missile. Later it was used occasionally as a sounding rocket, but much more often as the boost stage of a multi-stage sounding rocket. Status: Retired 1983. First Launch: 1953-10-23. Last Launch: 1977-11-19. Number: 240 . Payload: 70 kg (154 lb). Thrust: 217.00 kN (48,783 lbf). Gross mass: 709 kg (1,563 lb). Height: 6.01 m (19.71 ft). Diameter: 0.42 m (1.37 ft). Span: 1.52 m (4.98 ft). Apogee: 23 km (14 mi). One notable variant of the Nike in its sounding-rocket form was NASA's Nike Smoke. This consisted of a separable ten degree nose cone filled with titanium tetrachloride solution. This left a smoke trail in the sky, allowing winds aloft to be determined by optical measurement. Hundreds of Nike Smokes and two stage Nike-Nike Smokes were launched in the 1960's and 1970's. Payload: 70 kg (154 lb) to a 23 km altitude. Nike Nike American sounding rocket. 2-4 stage vehicle consisting of 1 x Nike + 1 x Nike + upper stages. Country: USA. Launch Sites: Wallops Island, White Sands LC33, White Sands, Cape Canaveral, Poker Flat, Fort Churchill, Tonopah, Eglin, Fort Churchill LC7, Eglin A-15. Stages: M5E1. Agency: NASA Langley. Bibliography: 2, 378. 1953 October 23 - . Launch Site: Wallops Island. Launch Vehicle: Nike. FAILURE: Failure. Navaho Model test flight - . Nation: USA. Agency: NASA. Apogee: 1.00 km (0.60 mi). First single-stage Nike sounding rocket / test vehicle flight..
1954 February 3 - . Launch Site: Wallops Island. Launch Vehicle: Nike. Navaho Model test flight - . Nation: USA. Agency: NASA. Apogee: 10 km (6 mi). 1954 March 1 - . Launch Site: Wallops Island. Launch Vehicle: Nike. FAILURE: Failure. Navaho Model test flight - . Nation: USA. Agency: NASA. Apogee: 1.00 km (0.60 mi). 1954 September 23 - . Launch Site: Wallops Island. Launch Vehicle: Nike. F-101A Model test flight - . Nation: USA. Agency: NASA. Apogee: 10 km (6 mi). 1954 September 24 - . Launch Site: Wallops Island. Launch Vehicle: Nike. F23 Ramjet test - . Nation: USA. Agency: NASA. Apogee: 10 km (6 mi). 1954 October 14 - . 20:24 GMT - . Launch Site: Wallops Island. LV Family: Nike. Launch Vehicle: Nike Nike HPAG. Stability test - . Nation: USA. Agency: NASA. Apogee: 10 km (6 mi). 1954 October 14 - . 21:20 GMT - . Launch Site: Wallops Island. LV Family: Nike. Launch Vehicle: Nike Nike T40 T55. Hypersonic Test re-entry vehicle test flight - . Nation: USA. Agency: NASA. Apogee: 352 km (218 mi). 1954 October 14 - . 22:12 GMT - . Launch Site: Wallops Island. LV Family: Nike. Launch Vehicle: Nike Nike T40. F40 Heat Transfer test - . Nation: USA. Agency: NASA. Apogee: 50 km (31 mi). 1955 January 5 - . Launch Site: Wallops Island. Launch Vehicle: Nike. 1955 January 12 - . Launch Site: Wallops Island. Launch Vehicle: Nike. Wing drag model test flight - . Nation: USA. Agency: NASA. Apogee: 10 km (6 mi). 1955 March 10 - . Launch Site: Wallops Island. Launch Vehicle: Nike. 1955 May 11 - . Launch Site: Wallops Island. Launch Vehicle: Nike. 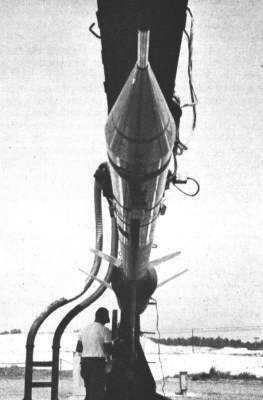 D22 Ramjet test - . Nation: USA. Agency: NASA. Apogee: 10 km (6 mi). 1955 May 26 - . Launch Site: Wallops Island. Launch Vehicle: Nike. 10 deg nosecone test - . Nation: USA. Agency: NASA. Apogee: 10 km (6 mi). 1955 June 23 - . Launch Site: Wallops Island. LV Family: Nike. Launch Vehicle: Nike Nike T40 T55. FAILURE: Failure. Heat Transfer Re-entry Vehicle test - . Nation: USA. Agency: NASA. Apogee: 30 km (18 mi). 1955 September 1 - . Launch Site: Wallops Island. Launch Vehicle: Nike. FAILURE: Failure. 1955 October 7 - . Launch Site: Wallops Island. LV Family: Nike. Launch Vehicle: Nike Nike T40 T55. 1955 December 14 - . Launch Site: Wallops Island. Launch Vehicle: Nike. B-58 Model test flight - . Nation: USA. Agency: NASA. Apogee: 10 km (6 mi). 1956 May 9 - . Launch Site: Wallops Island. Launch Vehicle: Nike. Avro Arrow Model test flight - . Nation: USA. Agency: NASA. Apogee: 10 km (6 mi). 1956 May 15 - . Launch Site: Wallops Island. Launch Vehicle: Nike. F4H-1 Model test flight - . Nation: USA. Agency: NASA. Apogee: 10 km (6 mi). 1956 June 7 - . Launch Site: Wallops Island. LV Family: Nike. Launch Vehicle: Nike Nike T40 T55. Heat Transfer Re-entry Vehicle test - . Nation: USA. Agency: NASA. Apogee: 100 km (60 mi). 1956 September 10 - . Launch Site: Wallops Island. LV Family: Nike. Launch Vehicle: Nike T40 T55. Heat Transfer Re-entry Vehicle test - . Nation: USA. Agency: NASA. Apogee: 10 km (6 mi). 1956 October 2 - . Launch Site: Wallops Island. Launch Vehicle: Nike. 1956 October 3 - . Launch Site: Wallops Island. Launch Vehicle: Nike. 1956 October 5 - . Launch Site: Wallops Island. LV Family: Nike. Launch Vehicle: Nike Recruit. Heat Transfer Re-entry Vehicle test - . Nation: USA. Agency: NASA. Apogee: 4.00 km (2.40 mi). 1956 October 9 - . Launch Site: Wallops Island. Launch Vehicle: Nike. 1957 May 2 - . Launch Site: Wallops Island. Launch Vehicle: Nike. Slender missile test - . Nation: USA. Agency: NASA. Apogee: 10 km (6 mi). 1957 June 19 - . Launch Site: Wallops Island. Launch Vehicle: Nike. 1957 August 13 - . Launch Site: Wallops Island. LV Family: Nike. Launch Vehicle: Nike Recruit. 1957 October 10 - . Launch Site: Wallops Island. LV Family: Nike. Launch Vehicle: Nike Recruit. 1957 December 13 - . Launch Site: Wallops Island. LV Family: Nike. Launch Vehicle: Nike T40 T55. 1958 March 24 - . Launch Site: Wallops Island. Launch Vehicle: Nike. 1958 September 8 - . Launch Site: Wallops Island. Launch Vehicle: Nike. FAILURE: Failure. E15 Model/Loki test - . Nation: USA. Agency: NASA. Apogee: 10 km (6 mi). 1959 March 10 - . 19:00 GMT - . Launch Site: Eglin. Launch Complex: Eglin A-15. Launch Vehicle: Nike. Cree III 28-1 - . Nation: USA. Apogee: 10 km (6 mi). 1959 June 18 - . Launch Site: Wallops Island. LV Family: Nike. Launch Vehicle: Nike Recruit. Mercury model test flight - . Nation: USA. Agency: NASA. Apogee: 10 km (6 mi). 1959 August 4 - . Launch Site: Wallops Island. LV Family: Nike. Launch Vehicle: Nike Recruit. 1959 September 21 - . 20:00 GMT - . Launch Site: Wallops Island. Launch Vehicle: Nike. Aeronomy mission - . Nation: USA. Agency: NASA. Apogee: 12 km (7 mi). 1960 September 8 - . 18:30 GMT - . Launch Site: Wallops Island. Launch Vehicle: Nike. Aeronomy mission - . Nation: USA. Agency: NASA. Apogee: 9.00 km (5.50 mi). 1960 September 23 - . 16:10 GMT - . Launch Site: Wallops Island. Launch Vehicle: Nike. Aeronomy mission - . Nation: USA. Agency: NASA. Apogee: 13 km (8 mi). 1961 February 15 - . 18:00 GMT - . Launch Site: Wallops Island. Launch Vehicle: Nike. Smoke Aeronomy mission - . Nation: USA. Agency: NASA. Apogee: 10 km (6 mi). 1961 April 6 - . 19:35 GMT - . Launch Site: Wallops Island. Launch Vehicle: Nike. Smoke Aeronomy mission - . Nation: USA. Agency: NASA. Apogee: 12 km (7 mi). 1961 April 7 - . Launch Site: Wallops Island. LV Family: Nike. Launch Vehicle: Nike Recruit. Reentry Stability re-entry vehicle test flight - . Nation: USA. Agency: NASA. Apogee: 10 km (6 mi). 1961 April 14 - . 15:30 GMT - . Launch Site: Wallops Island. Launch Vehicle: Nike. 1961 April 14 - . 19:35 GMT - . Launch Site: Wallops Island. Launch Vehicle: Nike. 1961 May 2 - . 21:15 GMT - . Launch Site: Wallops Island. Launch Vehicle: Nike. Cone test - . Nation: USA. Agency: NASA. Apogee: 14 km (8 mi). 1961 July 14 - . 16:00 GMT - . Launch Site: Wallops Island. Launch Vehicle: Nike. Aeronomy mission - . Nation: USA. Agency: NASA. Apogee: 14 km (8 mi). 1961 July 14 - . 21:20 GMT - . Launch Site: Wallops Island. Launch Vehicle: Nike. 1961 October 24 - . 16:10 GMT - . Launch Site: Wallops Island. Launch Vehicle: Nike. 1961 November 22 - . 15:30 GMT - . Launch Site: Wallops Island. Launch Vehicle: Nike. 1962 January 16 - . 21:10 GMT - . Launch Site: Wallops Island. Launch Vehicle: Nike. Aeronomy mission - . Nation: USA. Agency: NASA. Apogee: 16 km (9 mi). 1962 February 6 - . 19:00 GMT - . Launch Site: Wallops Island. Launch Vehicle: Nike. Aeronomy mission - . Nation: USA. Agency: NASA. Apogee: 17 km (10 mi). 1962 April 4 - . 20:50 GMT - . Launch Site: Wallops Island. Launch Vehicle: Nike. Aeronomy mission - . Nation: USA. Agency: NASA. Apogee: 11 km (6 mi). 1962 May 4 - . 20:30 GMT - . Launch Site: Wallops Island. Launch Vehicle: Nike. Aeronomy mission - . Nation: USA. Agency: NASA. Apogee: 18 km (11 mi). 1962 May 5 - . 18:40 GMT - . Launch Site: Wallops Island. Launch Vehicle: Nike. Aeronomy mission - . Nation: USA. Agency: NASA. Apogee: 15 km (9 mi). 1962 May 25 - . 17:40 GMT - . Launch Site: Wallops Island. Launch Vehicle: Nike. 1962 August 8 - . 19:15 GMT - . Launch Site: Cape Canaveral. Launch Vehicle: Nike. 1962 September 25 - . 20:28 GMT - . Launch Site: Cape Canaveral. Launch Vehicle: Nike. 1962 September 27 - . 08:08 GMT - . Launch Site: Eglin. Launch Vehicle: Nike. Aeronomy mission - . Nation: USA. Agency: USAF CRL. Apogee: 10 km (6 mi). 1962 October 3 - . 20:30 GMT - . Launch Site: Cape Canaveral. Launch Vehicle: Nike. 1962 October 8 - . 19:00 GMT - . Launch Site: Cape Canaveral. Launch Vehicle: Nike. 1962 October 10 - . 20:30 GMT - . Launch Site: Cape Canaveral. Launch Vehicle: Nike. 1962 October 19 - . 19:53 GMT - . Launch Site: Cape Canaveral. Launch Vehicle: Nike. 1962 October 29 - . 20:13 GMT - . Launch Site: Cape Canaveral. Launch Vehicle: Nike. 1962 November 1 - . 20:02 GMT - . Launch Site: Cape Canaveral. Launch Vehicle: Nike. 1962 November 5 - . 21:03 GMT - . Launch Site: Cape Canaveral. Launch Vehicle: Nike. Aeronomy mission - . Nation: USA. Agency: NASA. Apogee: 21 km (13 mi). 1962 November 6 - . 20:49 GMT - . Launch Site: Cape Canaveral. Launch Vehicle: Nike. 1962 November 13 - . 19:30 GMT - . Launch Site: Cape Canaveral. Launch Vehicle: Nike. 1962 November 16 - . 17:45 GMT - . Launch Site: Cape Canaveral. Launch Vehicle: Nike. 1962 November 16 - . 20:23 GMT - . Launch Site: Cape Canaveral. Launch Vehicle: Nike. 1962 December 4 - . 20:07 GMT - . Launch Site: Cape Canaveral. Launch Vehicle: Nike. 1962 December 6 - . 21:20 GMT - . Launch Site: Cape Canaveral. Launch Vehicle: Nike. 1962 December 10 - . 17:30 GMT - . Launch Site: Cape Canaveral. Launch Vehicle: Nike. 1962 December 11 - . 20:47 GMT - . Launch Site: Cape Canaveral. Launch Vehicle: Nike. 1962 December 13 - . 20:00 GMT - . Launch Site: Cape Canaveral. Launch Vehicle: Nike. Aeronomy mission - . Nation: USA. Agency: NASA. Apogee: 19 km (11 mi). 1962 December 14 - . 19:36 GMT - . Launch Site: Cape Canaveral. Launch Vehicle: Nike. 1962 December 17 - . 20:26 GMT - . Launch Site: Cape Canaveral. Launch Vehicle: Nike. 1962 December 18 - . 17:03 GMT - . Launch Site: Cape Canaveral. Launch Vehicle: Nike. 1962 December 19 - . 17:00 GMT - . Launch Site: Cape Canaveral. Launch Vehicle: Nike. 1962 December 20 - . 19:47 GMT - . Launch Site: Cape Canaveral. Launch Vehicle: Nike. 1962 December 21 - . 17:26 GMT - . Launch Site: Cape Canaveral. Launch Vehicle: Nike. 1962 December 28 - . 18:07 GMT - . Launch Site: Cape Canaveral. Launch Vehicle: Nike. 1963 January 3 - . 19:58 GMT - . Launch Site: Cape Canaveral. Launch Vehicle: Nike. 1963 January 3 - . 21:00 GMT - . Launch Site: Cape Canaveral. Launch Vehicle: Nike. 1963 January 4 - . 20:00 GMT - . Launch Site: Cape Canaveral. Launch Vehicle: Nike. 1963 January 9 - . 18:00 GMT - . Launch Site: Cape Canaveral. Launch Vehicle: Nike. 1963 January 10 - . 19:30 GMT - . Launch Site: Cape Canaveral. Launch Vehicle: Nike. 1963 January 11 - . 19:42 GMT - . Launch Site: Cape Canaveral. Launch Vehicle: Nike. 1963 January 17 - . 21:17 GMT - . Launch Site: Cape Canaveral. Launch Vehicle: Nike. 1963 January 18 - . 22:17 GMT - . Launch Site: Cape Canaveral. Launch Vehicle: Nike. 1963 January 22 - . 19:46 GMT - . Launch Site: Cape Canaveral. Launch Vehicle: Nike. 1963 January 28 - . 18:00 GMT - . Launch Site: Cape Canaveral. Launch Vehicle: Nike. 1963 January 31 - . 20:00 GMT - . Launch Site: Cape Canaveral. Launch Vehicle: Nike. 1963 February 7 - . 17:45 GMT - . Launch Site: Cape Canaveral. Launch Vehicle: Nike. Aeronomy mission - . Nation: USA. Agency: NASA. Apogee: 22 km (13 mi). 1963 February 13 - . 18:15 GMT - . Launch Site: Cape Canaveral. Launch Vehicle: Nike. 1963 February 20 - . 19:30 GMT - . Launch Site: Cape Canaveral. Launch Vehicle: Nike. 1963 February 27 - . 19:30 GMT - . Launch Site: Cape Canaveral. Launch Vehicle: Nike. 1963 March 8 - . 19:20 GMT - . Launch Site: Cape Canaveral. Launch Vehicle: Nike. Aeronomy mission - . Nation: USA. Agency: NASA. Apogee: 20 km (12 mi). 1963 March 11 - . 21:30 GMT - . Launch Site: Cape Canaveral. Launch Vehicle: Nike. 1963 March 12 - . 19:25 GMT - . Launch Site: Cape Canaveral. Launch Vehicle: Nike. 1963 March 18 - . 19:30 GMT - . Launch Site: Cape Canaveral. Launch Vehicle: Nike. 1963 March 21 - . 19:10 GMT - . Launch Site: Cape Canaveral. Launch Vehicle: Nike. 1963 March 22 - . 18:30 GMT - . Launch Site: Cape Canaveral. Launch Vehicle: Nike. 1963 March 28 - . 18:02 GMT - . Launch Site: Cape Canaveral. Launch Vehicle: Nike. 1963 March 28 - . 20:10 GMT - . Launch Site: Cape Canaveral. Launch Vehicle: Nike. 1963 April 2 - . 19:23 GMT - . Launch Site: Cape Canaveral. Launch Vehicle: Nike. 1963 April 3 - . 19:20 GMT - . Launch Site: Cape Canaveral. Launch Vehicle: Nike. 1963 April 5 - . 19:03 GMT - . Launch Site: Cape Canaveral. Launch Vehicle: Nike. 1963 April 11 - . 20:35 GMT - . Launch Site: Cape Canaveral. Launch Vehicle: Nike. 1963 April 12 - . 19:25 GMT - . Launch Site: Cape Canaveral. Launch Vehicle: Nike. 1963 April 15 - . 19:30 GMT - . Launch Site: Cape Canaveral. Launch Vehicle: Nike. 1963 April 16 - . 19:30 GMT - . Launch Site: Cape Canaveral. Launch Vehicle: Nike. 1963 April 17 - . 19:30 GMT - . Launch Site: Cape Canaveral. Launch Vehicle: Nike. 1963 April 22 - . 19:30 GMT - . Launch Site: Cape Canaveral. Launch Vehicle: Nike. 1963 April 25 - . 19:58 GMT - . Launch Site: Wallops Island. Launch Vehicle: Nike. 1963 May 7 - . 20:30 GMT - . Launch Site: Cape Canaveral. Launch Vehicle: Nike. 1963 May 8 - . 19:30 GMT - . Launch Site: Cape Canaveral. Launch Vehicle: Nike. 1963 May 14 - . 21:35 GMT - . Launch Site: Cape Canaveral. Launch Vehicle: Nike. 1963 June 7 - . 19:00 GMT - . Launch Site: Cape Canaveral. Launch Vehicle: Nike. 1963 June 19 - . 20:45 GMT - . Launch Site: Cape Canaveral. Launch Vehicle: Nike. 1963 July 1 - . 18:00 GMT - . Launch Site: Cape Canaveral. Launch Vehicle: Nike. 1963 July 17 - . 19:30 GMT - . Launch Site: Cape Canaveral. Launch Vehicle: Nike. 1963 July 26 - . 19:30 GMT - . Launch Site: Cape Canaveral. Launch Vehicle: Nike. 1963 July 31 - . 19:30 GMT - . Launch Site: Cape Canaveral. Launch Vehicle: Nike. 1963 August 7 - . 19:30 GMT - . Launch Site: Cape Canaveral. Launch Vehicle: Nike. 1963 August 15 - . 23:11 GMT - . Launch Site: Wallops Island. Launch Vehicle: Nike. 1963 September 19 - . 20:14 GMT - . Launch Site: Wallops Island. Launch Vehicle: Nike. 1963 September 19 - . 21:48 GMT - . Launch Site: Wallops Island. Launch Vehicle: Nike. 1963 September 23 - . 18:00 GMT - . Launch Site: Wallops Island. Launch Vehicle: Nike. 1963 September 30 - . 19:30 GMT - . Launch Site: Cape Canaveral. Launch Vehicle: Nike. 1963 October 1 - . 20:12 GMT - . Launch Site: Cape Canaveral. Launch Vehicle: Nike. 1963 October 1 - . 21:34 GMT - . Launch Site: Wallops Island. Launch Vehicle: Nike. 1963 October 4 - . 18:14 GMT - . Launch Site: Wallops Island. Launch Vehicle: Nike. 1963 October 9 - . 20:30 GMT - . Launch Site: Cape Canaveral. Launch Vehicle: Nike. 1963 October 11 - . 18:09 GMT - . Launch Site: Wallops Island. Launch Vehicle: Nike. 1963 October 15 - . 19:38 GMT - . Launch Site: Wallops Island. Launch Vehicle: Nike. 1963 October 22 - . 19:17 GMT - . Launch Site: Cape Canaveral. Launch Vehicle: Nike. 1963 October 30 - . 19:30 GMT - . Launch Site: Cape Canaveral. Launch Vehicle: Nike. 1963 October 31 - . 20:30 GMT - . Launch Site: Cape Canaveral. Launch Vehicle: Nike. 1963 November 6 - . 19:30 GMT - . Launch Site: Cape Canaveral. Launch Vehicle: Nike. 1963 November 12 - . 20:20 GMT - . Launch Site: Wallops Island. Launch Vehicle: Nike. 1963 November 13 - . 20:11 GMT - . Launch Site: Cape Canaveral. Launch Vehicle: Nike. 1963 November 15 - . 19:33 GMT - . Launch Site: Cape Canaveral. Launch Vehicle: Nike. 1963 November 21 - . 19:30 GMT - . Launch Site: Cape Canaveral. Launch Vehicle: Nike. 1963 December 5 - . 20:25 GMT - . Launch Site: Cape Canaveral. Launch Vehicle: Nike. 1963 December 20 - . 17:30 GMT - . Launch Site: Cape Canaveral. Launch Vehicle: Nike. 1964 January 22 - . 18:52 GMT - . Launch Site: Cape Canaveral. Launch Vehicle: Nike. 1964 January 22 - . 20:27 GMT - . Launch Site: Wallops Island. Launch Vehicle: Nike. 1964 January 24 - . 19:00 GMT - . Launch Site: Cape Canaveral. Launch Vehicle: Nike. 1964 January 29 - . 19:19 GMT - . Launch Site: Wallops Island. Launch Vehicle: Nike. 1964 February 4 - . 18:20 GMT - . Launch Site: Wallops Island. Launch Vehicle: Nike. 1964 February 19 - . 21:00 GMT - . Launch Site: Cape Canaveral. Launch Vehicle: Nike. 1964 February 20 - . 18:30 GMT - . Launch Site: Cape Canaveral. Launch Vehicle: Nike. 1964 February 26 - . 20:55 GMT - . Launch Site: Cape Canaveral. Launch Vehicle: Nike. 1964 March 13 - . 18:30 GMT - . Launch Site: Cape Canaveral. Launch Vehicle: Nike. 1964 March 13 - . 18:36 GMT - . Launch Site: Wallops Island. Launch Vehicle: Nike. 1964 March 17 - . 19:40 GMT - . Launch Site: Wallops Island. Launch Vehicle: Nike. 1964 March 18 - . 18:30 GMT - . Launch Site: Cape Canaveral. Launch Vehicle: Nike. 1964 March 20 - . 20:05 GMT - . Launch Site: Cape Canaveral. Launch Vehicle: Nike. 1964 March 27 - . 19:04 GMT - . Launch Site: Wallops Island. Launch Vehicle: Nike. 1964 March 31 - . 18:30 GMT - . Launch Site: Cape Canaveral. Launch Vehicle: Nike. 1964 April 1 - . 18:30 GMT - . Launch Site: Cape Canaveral. Launch Vehicle: Nike. 1964 April 3 - . 18:00 GMT - . Launch Site: Cape Canaveral. Launch Vehicle: Nike. 1964 April 9 - . 21:29 GMT - . Launch Site: Wallops Island. Launch Vehicle: Nike. 1964 April 13 - . 19:45 GMT - . Launch Site: Cape Canaveral. Launch Vehicle: Nike. 1964 April 17 - . 18:44 GMT - . Launch Site: Wallops Island. Launch Vehicle: Nike. 1964 April 22 - . 20:00 GMT - . Launch Site: Cape Canaveral. Launch Vehicle: Nike. 1964 May 4 - . 18:15 GMT - . Launch Site: Wallops Island. Launch Vehicle: Nike. 1964 May 5 - . 17:34 GMT - . Launch Site: Wallops Island. Launch Vehicle: Nike. 1964 May 6 - . 18:18 GMT - . Launch Site: Wallops Island. Launch Vehicle: Nike. 1964 May 6 - . 18:43 GMT - . Launch Site: Wallops Island. Launch Vehicle: Nike. 1964 May 19 - . 18:22 GMT - . Launch Site: Wallops Island. Launch Vehicle: Nike. 1964 May 20 - . 18:30 GMT - . Launch Site: Cape Canaveral. Launch Vehicle: Nike. 1964 May 21 - . 18:30 GMT - . Launch Site: Cape Canaveral. Launch Vehicle: Nike. 1964 May 22 - . 19:43 GMT - . Launch Site: Wallops Island. Launch Vehicle: Nike. 1964 May 25 - . 20:05 GMT - . Launch Site: Cape Canaveral. Launch Vehicle: Nike. 1964 May 27 - . 19:30 GMT - . Launch Site: Cape Canaveral. Launch Vehicle: Nike. 1964 June 9 - . 19:00 GMT - . Launch Site: Cape Canaveral. Launch Vehicle: Nike. 1964 June 10 - . 18:15 GMT - . Launch Site: Cape Canaveral. Launch Vehicle: Nike. 1964 June 11 - . 18:34 GMT - . Launch Site: Wallops Island. Launch Vehicle: Nike. 1964 June 12 - . 19:00 GMT - . Launch Site: Cape Canaveral. Launch Vehicle: Nike. 1964 June 15 - . 19:00 GMT - . Launch Site: Cape Canaveral. Launch Vehicle: Nike. 1964 June 17 - . 19:00 GMT - . Launch Site: Cape Canaveral. Launch Vehicle: Nike. 1964 July 6 - . 19:45 GMT - . Launch Site: Cape Canaveral. Launch Vehicle: Nike. 1964 July 15 - . 18:20 GMT - . Launch Site: Cape Canaveral. Launch Vehicle: Nike. 1964 July 28 - . 18:00 GMT - . Launch Site: Cape Canaveral. Launch Vehicle: Nike. 1964 July 29 - . 18:00 GMT - . Launch Site: Cape Canaveral. Launch Vehicle: Nike. 1964 July 30 - . 21:17 GMT - . Launch Site: Wallops Island. Launch Vehicle: Nike. 1964 August 14 - . 22:54 GMT - . Launch Site: Wallops Island. Launch Vehicle: Nike. 1964 August 19 - . 18:11 GMT - . Launch Site: Wallops Island. Launch Vehicle: Nike. 1964 September 3 - . 18:36 GMT - . Launch Site: Wallops Island. Launch Vehicle: Nike. 1964 September 4 - . 17:01 GMT - . Launch Site: Wallops Island. Launch Vehicle: Nike. 1964 September 9 - . 17:35 GMT - . Launch Site: Wallops Island. Launch Vehicle: Nike. 1964 September 15 - . 17:58 GMT - . Launch Site: Wallops Island. Launch Vehicle: Nike. 1964 September 25 - . 20:12 GMT - . Launch Site: Wallops Island. Launch Vehicle: Nike. 1964 October 13 - . 19:26 GMT - . Launch Site: Wallops Island. Launch Vehicle: Nike. 1964 October 22 - . 16:56 GMT - . Launch Site: Wallops Island. Launch Vehicle: Nike. 1964 October 30 - . 18:28 GMT - . Launch Site: Wallops Island. Launch Vehicle: Nike. 1964 November 13 - . 20:10 GMT - . Launch Site: Wallops Island. Launch Vehicle: Nike. 1964 November 24 - . 18:10 GMT - . Launch Site: Wallops Island. Launch Vehicle: Nike. 1964 December 1 - . 20:53 GMT - . Launch Site: Wallops Island. Launch Vehicle: Nike. 1964 December 8 - . 18:13 GMT - . Launch Site: Wallops Island. Launch Vehicle: Nike. 1965 January 5 - . 20:00 GMT - . Launch Site: Wallops Island. Launch Vehicle: Nike. 1965 January 14 - . 18:19 GMT - . Launch Site: Wallops Island. Launch Vehicle: Nike. 1965 January 21 - . 18:11 GMT - . Launch Site: Wallops Island. Launch Vehicle: Nike. 1965 February 2 - . 19:53 GMT - . Launch Site: Wallops Island. Launch Vehicle: Nike. 1965 February 5 - . 20:29 GMT - . Launch Site: Wallops Island. Launch Vehicle: Nike. 1965 March 11 - . 18:11 GMT - . Launch Site: Wallops Island. Launch Vehicle: Nike. 1965 March 31 - . 18:31 GMT - . Launch Site: Wallops Island. Launch Vehicle: Nike. 1965 April 30 - . 19:53 GMT - . Launch Site: Wallops Island. Launch Vehicle: Nike. Aeronomy mission - . Nation: USA. Agency: NASA. Apogee: 23 km (14 mi). 1965 May 13 - . 18:13 GMT - . Launch Site: Wallops Island. Launch Vehicle: Nike. 1965 May 14 - . 15:41 GMT - . Launch Site: Wallops Island. Launch Vehicle: Nike. 1965 May 18 - . 18:30 GMT - . Launch Site: Wallops Island. Launch Vehicle: Nike. 1965 June 1 - . 18:44 GMT - . Launch Site: Wallops Island. Launch Vehicle: Nike. 1965 July 1 - . 17:40 GMT - . Launch Site: Wallops Island. Launch Vehicle: Nike. 1965 July 14 - . 18:09 GMT - . Launch Site: Wallops Island. Launch Vehicle: Nike. 1965 July 21 - . 17:08 GMT - . Launch Site: Wallops Island. Launch Vehicle: Nike. 1965 August 12 - . 19:57 GMT - . Launch Site: Wallops Island. Launch Vehicle: Nike. 1965 September 23 - . 19:31 GMT - . Launch Site: Wallops Island. Launch Vehicle: Nike. 1965 October 5 - . 17:52 GMT - . Launch Site: Wallops Island. Launch Vehicle: Nike. 1965 October 29 - . 18:23 GMT - . Launch Site: Wallops Island. Launch Vehicle: Nike. 1965 November 2 - . 15:31 GMT - . Launch Site: Wallops Island. Launch Vehicle: Nike. 1965 November 17 - . 20:42 GMT - . Launch Site: Wallops Island. Launch Vehicle: Nike. 1965 November 18 - . 18:18 GMT - . Launch Site: Wallops Island. Launch Vehicle: Nike. 1965 November 23 - . 19:24 GMT - . Launch Site: Wallops Island. Launch Vehicle: Nike. 1965 November 30 - . 16:10 GMT - . Launch Site: Wallops Island. Launch Vehicle: Nike. 1965 December 7 - . 18:12 GMT - . Launch Site: Wallops Island. Launch Vehicle: Nike. 1966 January 11 - . 18:17 GMT - . Launch Site: Wallops Island. Launch Vehicle: Nike. 1966 February 21 - . 18:54 GMT - . Launch Site: Wallops Island. Launch Vehicle: Nike. 1966 March 16 - . 20:35 GMT - . Launch Site: Wallops Island. Launch Vehicle: Nike. 1966 March 17 - . 18:02 GMT - . Launch Site: Wallops Island. Launch Vehicle: Nike. 1966 July 22 - . 19:19 GMT - . Launch Site: Wallops Island. Launch Vehicle: Nike. 1966 September 23 - . 19:51 GMT - . Launch Site: Wallops Island. Launch Vehicle: Nike. 1966 October 7 - . 19:12 GMT - . Launch Site: Wallops Island. Launch Vehicle: Nike. 1966 October 11 - . 18:17 GMT - . Launch Site: Wallops Island. Launch Vehicle: Nike. 1966 October 28 - . 18:09 GMT - . Launch Site: Wallops Island. Launch Vehicle: Nike. 1967 October 5 - . 18:44 GMT - . Launch Site: Wallops Island. Launch Vehicle: Nike. Aeronomy mission - . Nation: USA. Agency: NASA. Apogee: 5.00 km (3.10 mi). 1967 October 5 - . 19:59 GMT - . Launch Site: Wallops Island. Launch Vehicle: Nike. Aeronomy mission - . Nation: USA. Agency: NASA. Apogee: 6.00 km (3.70 mi). 1969 March 27 - . 19:05 GMT - . Launch Site: Wallops Island. Launch Vehicle: Nike. 1969 March 27 - . 19:47 GMT - . Launch Site: Wallops Island. Launch Vehicle: Nike. 1969 May 13 - . 17:50 GMT - . Launch Site: Wallops Island. Launch Vehicle: Nike. 1972 February 29 - . Launch Site: Wallops Island. Launch Vehicle: Nike. Test mission - . Nation: USA. Agency: NASA. Apogee: 11 km (6 mi). 1975 March 27 - . Launch Site: Tonopah. Launch Vehicle: Nike. Test mission - . Nation: USA. Agency: Sandia. Apogee: 10 km (6 mi). 1975 April 18 - . Launch Site: Tonopah. Launch Vehicle: Nike. FAILURE: Failure. Test mission - . Nation: USA. Agency: Sandia. Apogee: 0 km (0 mi). 1975 October 29 - . Launch Site: Tonopah. Launch Vehicle: Nike. 1975 October 31 - . Launch Site: Tonopah. Launch Vehicle: Nike. 1976 February 7 - . 00:05 GMT - . Launch Site: Poker Flat. Launch Vehicle: Nike. GI-PFRR Launcher test - . Nation: USA. Agency: PFRR. Apogee: 1.00 km (0.60 mi). 1976 June 9 - . 18:00 GMT - . Launch Site: Wallops Island. Launch Vehicle: Nike. Nation: USA. Agency: NASA. Apogee: 20 km (12 mi). 1977 November 19 - . 23:52 GMT - . Launch Site: Poker Flat. Launch Vehicle: Nike. Test mission - . Nation: USA. Agency: Alaska. Apogee: 1.00 km (0.60 mi). Final single-stage Nike sounding rocket / test vehicle flight..